Unfazed by the alliance of Janata Dal-United chief Nitish Kumar, Rashtriya Janata Dal's Lalu Prasad and Congress, the Bharatiya Janata Party plans to seek mandate on development agenda. In a telephonic interview with Sanjay Jog, Bihar's former deputy chief minister and senior party leader Sushil Kumar Modi explains the party's poll strategy. The Opposition has slammed Prime Minister Narendra Modi's Rs 1.25 lakh-crore package for Bihar. What is your comment? Let me first clarify that the Rs 1.25 lakh-crore package has nothing to do with the ensuing assembly elections in Bihar but it was fulfilment of the promise given by the BJP during the Lok Sabha polls held last year. The prime minister made announcement after 18 months in power and not at the end of his five-year tenure as done by former prime minister Rajiv Gandhi who had announced a Rs 5,000-crore package at the fag end of his term. What will be the BJP's poll plank? The government led by the Congress, Lalu Prasad and Nitish Kumar in the past was tried, tested but failed to deliver and take state's growth to a new high. They have not done anything substantial for Bihar. 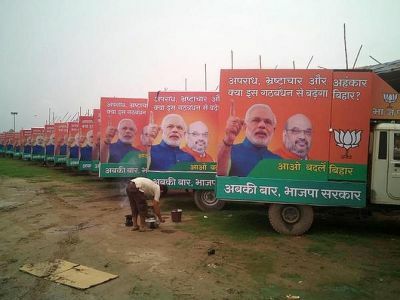 The BJP firmly believes that the central aid is required to spur Bihar's growth and therefore appealing to the voters to give the BJP a chance to rule. With the BJP at the Centre, it will be quite helpful to get central assistance and thereby boost development. We are approaching voters on the development plank and will see that it is not diverted by Nitish Kumar-Lalu Prasad-Congress alliance. Further, the BJP will expose Nitish Kumar's betrayal of three-fourths' majority got for the BJP-JD-U alliance in the last assembly election. The combine has lost credibility, as it is an alliance of opportunists. The Opposition says the BJP-led government at the Centre has neglected Bihar. How will you counter it? It is totally incorrect. During the last 18 months, the Centre has helped the state a lot and there is little substance in the opposition's charge. On the other hand, the BJP will question the combine to give the report card and provide answers to a slew of questions. ''Hisab do, jawab do'' will be the party's tag line. The BJP will seek answers from Nitish Kumar on a range of issues such as drop in growth rate, drastic fall in agricultural growth, slow down in the road sector, deterioration in law and order situation and lack of new investments in the state during his 25-month rule after he severed ties with the BJP. Your rivals are accusing your party of causing communal polarisation. What is your take? Let me repeat we will fight the election on the development agenda. It is Nitish Kumar-Lalu Prasad-Congress alliance which is diverting the attention of voters by raking up issues relating to DNA, caste census and Bihar's BIMARU status. This will not impact the prospects of the BJP-led alliance. Nitish Kumar’s DNA is that of betraying friends and allies whereas the DNA of Bihar represents harmony and welcoming a guest with dignity. This apart, there are 32 per cent EBCs (economically backward classes), 16 per cent Dalits and Mahadalits. They will certainly not vote for the alliance but cast their votes to BJP. The manner in which Jitan Ram Manjhi was removed as the chief minister, Dalits and Mahadalits are very much annoyed with Nitish Kumar. Now, in the present context, Mandal and Kamandal are with the BJP. Moreover, BJP allies with their tallest leaders have influence in the respective communities and constituencies. Will consolidation of Muslim votes benefit Nitish Kumar-Lalu Prasad-Congress combine? It won't be as even the Muslim community has voted for the BJP in the Lok Sabha elections. The party expects similar trend in the assembly elections, in the respective communities and constituencies.